April never promised to be the busiest month in this year’s calendar and work-wise, that has been particularly true because of the way in which Easter has fallen this year. However, on a social, family and learning front – it has been non-stop rock and roll. See http://saturdaywalks.wordpress.com for more about the social side of April (and especially, Easter). I started the month by finishing off some City and Guilds Functional Skills ICT marking; all done and dusted by 7th. Earlier, on the 4th, I went into Leeds to meet Lilian Soon, James Clay, John Whalley and Ron Mitchell for a meal and a chat – a fabulous F2F! We talked about all sorts and as always, it’s great to meet these creative friends. On the 6th, I met Lilian and Ron again (along with many other fun and ‘e’ type chums) at a special Techdis (no longer TechDis) meeting for Accredited Trainers. Then on the 7th, I went over to the Salford TEN centre to join the RM team at a day-long LEGO training session. This session concerned a grown up version of LEGO, not the WeDo version I’ve been playing with in-between everything else this last few weeks. On the 9th, we realised that the good weather which had started earlier in the week, just wasn’t going to go away – which was good because Sharon and I had to drive up to Glasgow to retrieve her mum Pat. Pat lives in Dothan, Alabama and had been staying up near Plockton, Kyle of Lockalsh visiting her terminally ill sister (Sharon’s aunt). Sadly, her sister had passed away and her nephew David agreed to bring her down to Glasgow for the ‘exchange’. It was a beautiful day and the journey was an absolute delight. w/c 11th was spent playing with LEGO and carrying out some preparation for work I have coming up in June and July. I have a small piece of work to carry out for RM on their learning platform on the 28th and that’s that for April. 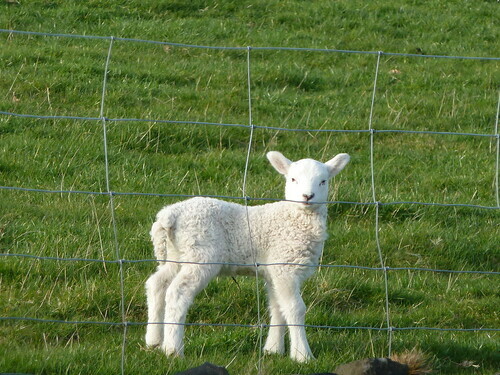 Remember to look at http://saturdaywalks.wordpress.com for more ‘Easter’ blogging. I have an iPhone 3GS and despite various horror stories, I have kept up to the updates and have always been pleased with them. Until yesterday! I plugged the phone into my MacBook Pro last night with the intention of transferring some photos to iPhoto. Bluetoothing would be easier (a task I accomplish regularly with my Nokia N95 + Mac) but that seems to be a feature that iPhone + Mac finds impossible (it might be me? – but I doubt it). Anyway, a box popped up with iTunes saying that an update to the iOS (4.2.2 I think) was ready – would I like to install it. As usual, I said ‘yes’. Again as usual, it also prompted me (luckily) to synch recent purchases/updates on the iPhone with iTunes. That done I proceeded with the update/installation of iOS 4.2.2. And it never ended. The phone ‘froze’ and after an hour, I decided to unplug it and eventually, to restore factory settings. But the phone was well and truly frozen – nothing was happening. I left it on all night and nothing happened. So this morning I attacked the support forums. They are well worth browsing – but don’t, like me, ignore the essential information! Most of those discussing my own and similar problems said to make sure that ‘you’ were using the most up to date iTunes. I glibly assumed I was using the most up to date iTunes, because I have an auto-update switch ticked somewhere. However, when I was about ready for booking a genius appointment at the (not so) local Apple Store, Sharon made me check iTunes. When I say ‘made‘, I do of course mean ‘forced, coerced and/or shamed‘ me into doing it. At that point, where the box came up and said ‘there is an update waiting for your iTunes’, I remembered it popping up on Sunday last – but I was busy then with something else so I told it to go away (postponed it!). Anyway, iTunes updated and then, when I plugged in the iPhone, it began the restore process; followed by the re-synching process and ultimately by me giving up a huge sigh of relief. Phew. I’m not altogether clear WHY iTunes HAS to be updated BEFORE any updates to peripherals but I do know now just how symbiotic the ‘i’ products are. I’d not previously understood just how reliant on iTunes the iPhone was and it has made me open my mind to the dark-side of Apple. Were Microsoft not prosecuted by the EU for making IE an essential part of their OS? Last week I was told off by Ron Mitchell (told off is a bit harsh, smiled at would be a better description) for not backing up my ‘play’ Moodle installation before trying to install a new module – but I haven’t learned have I? My advice then, to anyone reading this is ALWAYS make sure you have BACKED UP, or problems like mine above, become a crisis. Here’s a drumming monkey I made last week! bit.ly – a better LMS? Some readers may have followed my exploration of facilities offered by http://fur.ly and how it might be used as a learning management system (LMS). At the end of my most recent post, (see 3, below) I said ‘watch this space’, as I intended to explore another service – http://bit.ly. I have now had the chance to delve into bit.ly and explore what turns out to be its greater potential for use as an ad hoc LMS. First of all, to get the most from bit.ly, you need to register. It does work as a URL shortener without registration, but to use it to its full potential (which I don’t think I have yet fully tapped), you do need to register. It’s a painless process. When you have logged in, you will see that over time, the URLs that you have reduced in length are all logged in your ‘area’. If, as I have done today, you wish to bundle some links together you can do this. Simply click on the offer to bundle your most recent links. You then have the opportunity to add/delete links as required and to rearrange them. Where http://bit.ly has the edge over fur.ly, is the way it allows the LMS designer to add an introduction (instructions) and allows the end user to comment/collaborate on the outcomes. This looks like it might be a powerful feature but I haven’t explored it. Please let me know if you do explore it. There is also an analytics section which I have not explored either, but which may in time come into its own. If you have a play with it, do please let me know how you get on. Interested users will see that I have once again added a Google Form to gain feedback – you could use this as a formative test at the end of the web site sequence. As I suggested in my previous post, fur.ly could be used for so much more than shortening URLs or even (as I have been doing within my #sugsnips) aggregating URLs. For instance, here is an example of it being used as a learning management system – LMS. Obviously, anyone following the learning episode above will find huge pedagogical holes in what I have slung together, but that is all I did: I just slung a learning journey together from a few web sites I knew of and hoped that users/readers would ‘get’ the point of the exercise. My biggest challenge was deciding upon a site that would allow me to have simple pages that linked the learning journey together, for this I chose http://shrib.com. Shrib has the advantage of (similar to all of the Etherpad clones) having an editable URL. Anyone following the route will notice that I’ve used bloom1, bloom2 and bloom3 as my ‘tail’. The downside (for now) is that these are probably editable by anyone – so just how I would overcome that remains to be seen – but for now it’s ok – it works. I’ve used Shrib to provide online pages, which explain how to use the fur.ly page for going backwards and forwards through the web sites presented and what to do at each stage. My preparation includes locating the web sites I wanted to use and the order in which I wanted to present them. I then created the intervening Shrib pages to separate the websites and finally – having decided what the user would need to look for on those pages, I created an end-test using Google Forms. In real life I might have asked the user to give me their name and email address, so that I could give them feedback but for the purposes of this demonstration the end test restricts itself to 2 simple questions and a comment box. So, is this really a form of impromptu learning management system (LMS)? I think it is. I think it will suit those who are working outside of institutions (maybe WBL, ACL, Voluntary etc.) as a means of guiding learners. I’ve tried the resulting journey on my iPhone and it seems to work very well, opening each page as required and allowing me to contribute to the Google Form. I’d love to know what you think. Please comment below or DM on Twitter. Part of my investigation has allowed me to delve further into bit.ly http://bit.ly the URL shortener mentioned in my previous post. This may have great potential than fur.ly as it can bundle URLs too. It also presented the URLs in a friendlier way than fur.ly. Watch this space. Since starting my #sugsnip challenge back in the New Year, I’ve had many opportunities to ask (some) readers what they thought. They think it’s a good idea and many have taken the opportunity to comment, either directly to me, via Twitter or via their own RTs and Paper.li’s. This has been encouraging. What has been less encouraging though, has been their (slight) misunderstanding of the role fur.ly plays in my #sugsnip, or of the huge potential fur.ly offers many educationalists and learners. I have a few ideas for how the service can be used and will use this blog post and the next to explain a couple of these. First let me explain fur.ly’s basic functionality, because that is one thing my discussions with #sugsnip readers have led me to believe is underestimated at best. Services such as http://bit.ly, http://tinyurl.com, and http://snipurl.com offer URL shortening services where long URLs are greatly reduced in length (e.g. 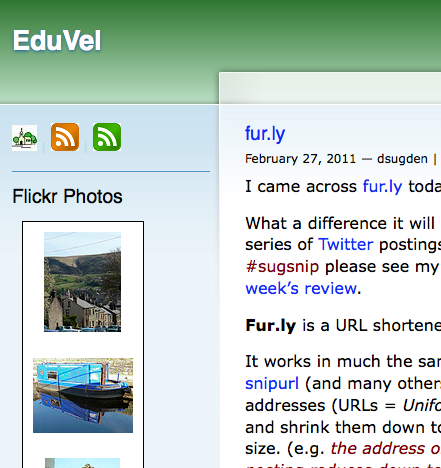 my previous EduVel blog post would reduce from https://eduvel.wordpress.com/2011/04/08/response-to-kathy-schrock/ to http://bit.ly/hdIBe1; http://tinyurl.com/6c8dddh and http://snipurl.com/27rqug respectively. A saving of 45, 39 and 40 characters – which is important when we consider the increasing use of micro-blogs such as Twitter, which are often character-limited (Twitter has a maximum 140 characters, so a saving of this size is a huge benefit). So the first advantage of fur.ly then is URL length – as it returns a URL length of 18 characters, a saving of 47 over the original. The second and for now, most powerful advantage is that it can hold more than one web address within the URL it presents. It is a URL aggregator. Notice the arrow is pointing to the area that indicates which page (of how many) you are on. Now all of this has led me to explore other potential uses for Fur.ly and I will detail those on my next blog post. I was recently introduced to Kathy Schrock’s blog http://blog.kathyschrock.net/ by Barrie Roberts on Twitter http://twitter.com/bardenblade/. Kathy’s 30th March post presents her ideas for applying Google tools to Blooms Taxonomy and showed us this picture http://kathyschrock.net/googleblooms/. The image is a wonderful piece of work and joins a creditable canon of other attempts to capture educational theory within a social media context. I’m prompted to respond because for once, the image seems to recognise the fact that different levels of Blooms technology can be addressed by almost ANY technology – as it is not necessarily the technology that counts, but the way in which the technology is employed. In many of my workshops I provide a quick and dirty reminder of Bloom’s and the Revised Taxonomies. I do this to show the participants (usually teachers of one kind or another) that even mobile phones used for texting can address different levels of the taxonomy. 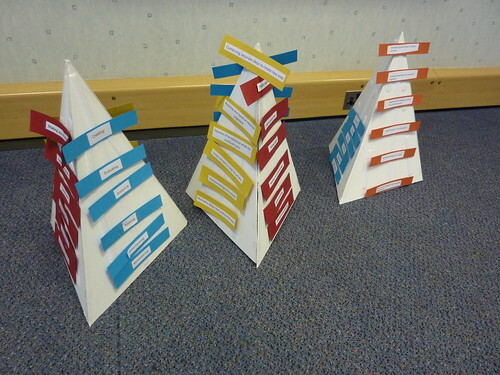 I then ask them to recognise the ways in which various Web 2.0 sites can be used and require the participants to place (velcro’d) Web 2.0 logos (onto model pyramids I have made for the task*) according to how they (the participants) feel the site could be used. Invariably, tools like YouTube are seen as lower order thinking skills (remembering, understanding and applying – LOTS) and some blogging tools are seen as HOTS (higher order thinking skills). I firmly believe that each tool we use could/can be applied at the higher levels of Bloom’s. It is the skills of the teacher/tutor/lecturer – whoever, to ensure that the learner’s task requires THEM – the learner, to work at that higher level. Hence (and you will see this on Kathy’s blog picture) YouTube can be used at the top – Creation level. It can also be used at the Remembering level – hence my own filleting fish video, used by learners to simply remember/understand how to do the task before ‘applying’ it. *The pyramids have three faces and I use each face for a different task. They are made of a pressed polystyrene and can be assembled out of my suitcase (I am a peripatetic trainer). Well, April is here and the sun is shining. 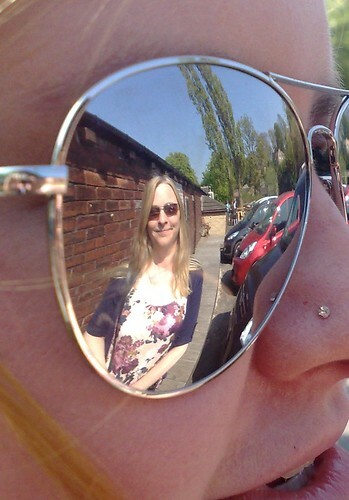 To be fair, the sun has shone now, on and off, for a whole month – March being one of the driest on record (apparently). And with April, comes the end of my first three months of submitting #sugsnips on Twitter. In fact April 1st was the ninety first; the end of my thirteenth week. 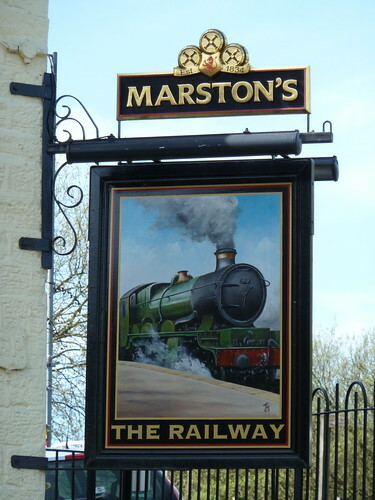 I’ve also post facts and information that has always been of interest to me such as the ‘food’ weeks (there’s another coming up tomorrow – 4th April). These have also been the ones which have received the most interest, with the ‘cheese’ week receiving notice from Jon Traxler, Claire Bradley (2), James Clay, Matt Pearson and Steve Halsted. That week, I also posted four bonus Tweets which supplemented the daily serving. 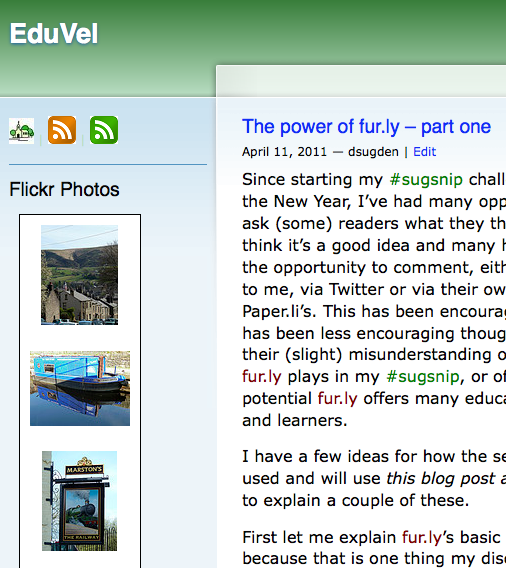 I’ve begun to use http://fur.ly/ more now as it gives me the chance to post even more evidence of my ‘snip’ without using up too many of the Tweet’s 140 characters. I think the most URLs I’ve crammed in to Fur.ly is six, but it could probably take more. I do wonder though, how people explore evidence presented in this way, as it doesn’t seem overly obvious how to access the packages URLs or how many there are. Any comment? Responses and comments have been great and it always gives me a sense of achievement when someone RTs or replies: I feel then that I have helped in some (very) small way. And that’s what I see my job as – helping others. I set out to show how techniques such as this (daily, timed snippets of … whatever) could be used to supplement a learner’s understanding.